His Eminence the 7th Dzogchen Rinpoche, Jigme Losel Wangpo, is one of the highest lamas within the Tibetan Buddhist tradition and the principal authority on the practices and teachings of the Dzogchen lineage, guiding both monastic and lay students from around the world. Dzogchen Rinpoche was born in Sikkim in 1964 and was recognised as the Dzogchen lineage holder by His Holiness the 4th Dodrupchen Rinpoche, Thupten Trinley Palzang. This was confirmed immediately by His Holiness the 14th Dalai Lama Tenzin Gyatso. In the authentic Dzogchen tradition, Dzogchen Rinpoche's enthronement was led by H.H. the 4th Dodrupchen Rinpoche, on the 8th October 1972 in Sikkim’s Royal Palace at Gangtok. As a young tulku, Dzogchen Rinpoche was trained closely by H.H. Dodrupchen Rinpoche and Khenpo Rahor Thupten in the authentic teachings and rituals of the Dzogchen tradition. The Dzogchen Rinpoches and the Dodrupchen Rinpoches recognise each other in turn to ensure the authentic continuation of the lineage. This historically significant relationship is exclusive and these two great lamas hold the definitive view of the Dzogchen tradition. In 1976 Dzogchen Rinpoche joined the Buddhist School of Dialectics in Dharamsala, completing seven years of intense training in both the Nyingma and Gelug schools of Tibetan Buddhism. Dzogchen Rinpoche's education was personally supervised by H.H. the Dalai Lama and many other great masters, including H.H. Dudjom Rinpoche, H.H. Dilgo Khyentse Rinpoche and H.H. 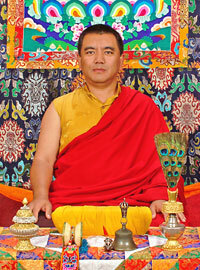 Trulshik Rinpoche. Rarely has there been such thorough training completed by a young lama and Dzogchen Rinpoche became renowned for his accomplishment both as a scholar and a debate master. Having mastered many of the great texts of Tibetan Buddhism, Rinpoche obtained the title of Rabjampa [Masters of Tibetan Buddhism] at only 19 years of age. Following the destruction of Dzogchen Monastery during the Cultural Revolution in Tibet in the late 1950’s, Dzogchen Rinpoche and his father, Tsewang Paljor, relocated to the Dhondenling settlement in South India to begin the re-establishment of Dzogchen Monastery, at the request of H.H. the Dalai Lama. Before construction could begin, the land was cleared and levelled by the local exiled Tibetans, so that the building foundations could be laid. Then, Dzogchen Rinpoche and his family, with the assistance of Ven Gen Rangjung, a great practitioner who was the student of the fifth, and the attendant of the sixth and seventh Dzogchen Rinpoches, began raising funds for the new buildings. Construction work began in the late 1980’s and after three decades of extensive development Dzogchen Monastery has become one of the most influential institutes of the Nyingma tradition. Each year the monastery is expanding and monks travel from Tibet, Nepal and Bhutan for an opportunity to live and study at Dzogchen Monastery. Dzogchen Rinpoche also has students all over the world who study and practice the Dzogchen lineage particularly the Dzogchen Khandro Nyingthig which was composed by the great 3rd Dzogchen Rinpoche, Ngedön Tendzin Zangpo. The international sangha support the charitable activity of Dzogchen Shri Senha Charitable Society (DSSCS), founded by Dzogchen Rinpoche in 1995. Shenpen, a network of organisations under the umbrella of DSSCS, dedicated to benefiting those in need without condition, has been established in America, Australia and throughout Europe. Please visit Gyalwa Dzogchenpa website for more information.